In this Goa resort List we have collected all our budget resorts in Goa, please keep in mind that the prices during peak season are always higher, if you seek a cheaper holiday in Goa, you might need to consider not booking during Dec 15th till Jan 20th. In the last few years with the prices of resorts in Goa climbing up, it has become harder to find a budget resorts in goa. It is not a big secret that Goa has been, for many years, attracting let’s call it financially challenged travellers, and especially resorts in south Goa where considered a cheaper alternative to other places with similar advantages. most of these resorts are gone now, developed and renovated and with new price tag on too, not only the rooms have evolved, the resorts are offering more amenities and better customer care. Today most beach resort in Goa are offering bigger rooms, large balconies, attached hot water shower, and comfortable beds. But even among those Goa resorts, there is a wide scale of prices and class, the thing is the prices and the classes not always go hand in hand, and paying a lot for your accommodation doesn’t necessarily mean better resort. 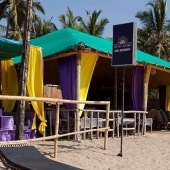 Still some of the best beach resorts in Goa, remain faithful to the old style of Goa hosting, these secret places are simple, secluded, short in staff, cheap and mostly full, unless you are willing wait for a room to check-out or just got lucky enough. Neptune Point Beach Resort, this wonderful beach resort is set just on the beach at the far south end of palolem, accessible from the back to Palolem road, it has been recently re-decorated and still has the new resort feeling to it. Neptune Point Goa beach resort has 24 new cottages, of 3 classes set the beach around the resort restaurant and bar areas, some are AC, others without, all rooms have private balcony well equipped for chilling and viewing Palolem beach surroundings. Neptune Point beach resort has its own restaurant and bar serving Indian,and continental food, tandoori oven, fresh sea-food every day, resort desk and employees will be glad to assist with extra services like laundry, tickets, taxi pickups, and fair advice. Neptune Point cottages are quiet and beautiful, some are AC, all have fans, mosquito nets, toilets, shower and king-size bed with comfortable mattresses , and fantastic balconies with sitting areas – some are directly sea facing while other offer partial sea views or facing the internal garden. The resort offers free Wi-Fi, and beautiful common spaces are available for the benefit of resort guests. Set on the quiet North side of Colomb Bay, Laguna Vista has become a well-loved beach hut resort among-st tourists and long-term visitors alike. 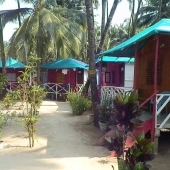 This beach hut resort is ideally located only a few feet from the sea and directly on Colomb beach, between Patnem beach and Palolem beach, just a 5-minute walk from both. Laguna Vista has a gorgeous little boutique, where you will find items not available anywhere else. They stock original designs of both jewellery and clothing, made of natural fabrics from Nepal, India and Thailand. Despite the tranquil getaway appeal of this South Goa beach resort, every Friday night Laguna Vista offers a Live Music night, showcasing a blend of original songs with Western and Indian influences. These regular shows have become really popular, making Friday night in South Goa a night to remember. 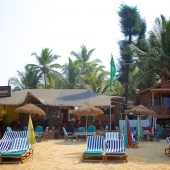 Laguna Vista Resort in Colomb Beach Patnem in Goa, affordable accommodation on the beach, the resort is very small 9 rooms at most, all facing goa beach, few meter of the water of colomb bay. 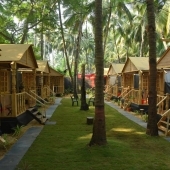 as mentioned the huts at Patnem beach huts at Laguna Vista Goa Resort are set on the beach, with private balconies, attached shower, and just next to the resort Goan restaurant. 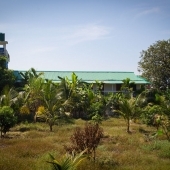 booking a room in Laguna Vista Resort Colomb Beach Patnem can be done here. 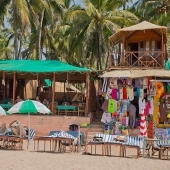 resorts and huts on the beach and south goa beach resort altogether, even agonda beach huts cant compete with the prices, and value for money of booking online for resort in Colomb Beach near Patnem and Palolem, the location in this case is everything. 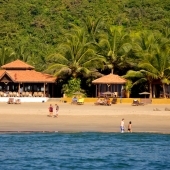 Colomb Beach is a fisherman village set just on the border of Palolem and Patnem beach in south Goa India. yet it is still providing a fair cottages in Goa selection, relative to its size. Stay 3+ Nights and get 15% OFF on room rates. 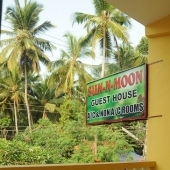 Sun N Moon Guesthouse is located at center of the Palolem beach village, Goa. This south Goa guesthouse offers six comfortable and affordable luxury Rooms, and provides all season accommodation, perfect for the hot summer months and monsoon. All rooms are well furnished with A/C or Non A/C, Satellite TV, Refrigerator and some rooms have a mini-kitchen with necessary (basic) utensils. Sun N Moon Guesthouse also offers India and international travel booking services and an Internet Cafe. Sun N Moon Guesthouse, Palolem beach, Goa is a very recommendable place with a high level of customer service and good security. 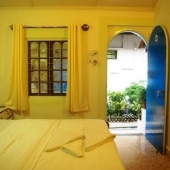 Sun and Moon guest house in Goa is one of the only resorts in Goa active all year long, it welcomes all travelers, with fair prices and good clean rooms, offering great service and a perfect location. Booking with Sun and moon resort in Goa now, even during monsoon month, you will find a dry room and an open door. 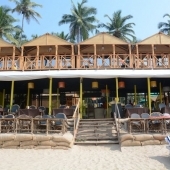 this resort does not offer Goa beach huts but concrete rooms the kind you might find in hotels in Goa beach, It is set in the main street of Palolem near by all the best restaurants and Coffee joints, a fun place to be in top season of Goa. 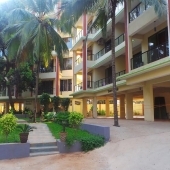 In compare with other beach resorts in Goa this is a basic plus standard resort, the hotel is clean, as are the rooms and the staff is well trained and very helpful. Zappia Cove Guest House, is a well established resort in Palolem beach, the resort is set about 50 meter from the beach, close to the centre and the main road, surrounded by the best restaurants, bars and cafes in Palolem. Zappia Cove Guest House is built within an amazing private garden, and the atmosphere in the resort is shanti and relaxing, comparing to other resorts in Goa, Zappia cottages are probably few levels above the standards, certainly for Palolem beach. The resort is open all around the year, and is a fantastic escape during the long wet month of the monsoon when most of the other Goa beach resorts are close. Zappia Cove resort restaurant is serving Indian and continental food, complimentary simple breakfast of fruit, toast, eggs, juice and hot beverage is included in the room price. Zappia Guest House cottages are clean and well build concrete, most are AC, all rooms include of double beds, mosquito nets, in-suite shower and ceiling fans , facing the internal garden, with sitting compoands. The resort garden offers large common areas to chill in, free Wi-Fi is available most of the time for resort guests. Palolem Garden Estate is ideally located a 10 min walk to both Palolem and Patnem beeches and offers luxury one and two bedroom apartments with a shared outdoor swimming pool. Perfect for a family holiday in Goa or couples, these newly constructed modern apartments are located off the Palolem to Patnem road and are set around lovely gardens. These self service apartments are equipped with AC, comfortable queen size beds, living room, full kitchen, ensuite bathroom with hot water, private balcony, safe, cable TV & Wi-Fi Internet. Khaama Kethna is a one-of-a-kind eco-resort situated in the jungle off the road that runs from Palolem beach to Agonda beach in south Goa. 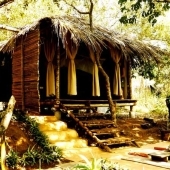 Consisting of amazing tree huts, bamboo huts, a stunning restaurant and even an outdoor movie screen, Khaama Kethna is a uniquely green eco-resort located on the only organic farm in south Goa. The incredible nature and the care that has been taken to make sure this eco-resort blends in with it, make Khaama Kethna a must-see for any nature-loving traveller with a leaning towards eco-tourism. Easily accessible, it is also totally child friendly, and the weekly outdoor movies during the season add to the attraction of this jungle resort. 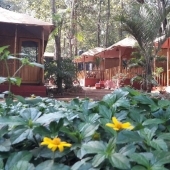 Khaama Kethna Resort is set near by Agonda beach Goa, on the road leading down south to Palolem in Canacona, it is an alternative Eco friendly resort, set in the Goan jungle, very very special place to visit. 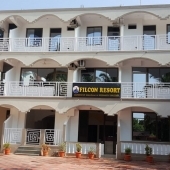 visitors staying in this resorts are always very satisfied with there choice og accommodation, as the atmosphere in this Goa resort is truly one of a kind. The Khaama Kethna Resort in Agonda was established around 3 years ago, by an artist of construction, make it a very unique resort, the huts are set beautifully and not too close to one another. This Agonda resort can not be compared to resorts in Agonda, as it is there to serve a special type of traveler, looking for huts in Goa in a distant place, seeking to be alone with nature, and away of Goa lifestyle. One of the few Eco friendly resorts in Agonda and in Goa, a perfect retreat for yoga and meditation, a good place to meet interesting people, and Goa experience nature very closely. One thing is sure, the phrase Agonda eco Retreat is not something you hear everyday. Patnem Holiday Suites offers a new accommodation choice in Patnem for people looking for clean modern alternatives to a beach hut - but within easy walking distance of white sands and sparkling seas. With two houses, three studio apartments and 11 rooms, this Goa resort a great option for families and group bookings, as well as anyone looking for modern villa type accommodation for their Goa holiday. Patnem Holiday Suites - Goa Holiday Homes have all been newly renovated with modern amenities including comfortable mattresses, fresh bed linen & towels, night tables, hot & cold water, fans & balconies. Two of the rooms also have air conditioning. Although there is no restaurant on site, all of the rooms have a kitchenette with fridge and cooker, and the local store sells a good range of supplies, with more to be found in Chaudi, a town a few minutes drive away with a good fish and vegetable market. 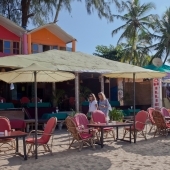 But if you don't feel like cooking, then Patnem Holiday Suites is only a short walk from Patnem beach, with its great selection of shacks, restaurant and bars. Stay 2+ Nights and get 20% off on Room rates. Offer Valid till 30th October 2018. Shiva’s Place is probably the not largest or the most exclusive beach resort in Goa, but what it lacks in luxuries, it sure makes up with hospitality, comfort, and wonderful service.. The resort is more or less in the middle of Patnem beach, surrounded all sides with restaurants, and beach huts, being placed there is a big advantage, especially if you are here in Goa peak season, this is where it’s all happening in Patnem, just a short stroll from the main road, where you can find shops, many restaurants, yoga and healing centres and more. The main common area is the Shiva’s Place Bar/Restaurant, a very good restaurant actually, serving all day and till late night, it is set just on the beach boasting a wonderful view of the beach, above the restaurant there are 2 beachfront huts, the best accommodation this small resort has to offer. 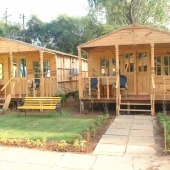 The rest of the huts and cottages, are located at the back of the resort, behind the common area, build close to one another, in a small garden, the rooms are clean, simple and comfortable. Big Fish Resort in Palolem beach, is one of the first beach resorts ever to be built on Palolem Beach, established at the late 90’ on the far south end of the beach, It is till this day a well-known spot for grateful returning guests and first timer in Goa alike. The atmosphere in the Big Fish is very friendly, the owners and local staff are an amazing bunch, and many of their customers keeps in close touch with them for many years after their visit. The resort is set on the sea front, at the end of Palolem, near the rocks path leading up to Colomb village and then to Patnem beach. On the front, sea side part of the resort you will find the in-house, well established, Big Fish restaurant, side by side with a couple of sea-front huts. Behind the restaurant there is a small sunny garden, surrounded with beach cottages, some are on the ground others on stilts. The resort is offering free Wi-Fi, great dinning option, a late night bar, and the rooms are tastefully decorated and sufficiently furnished. 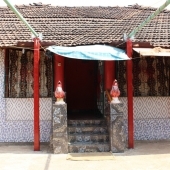 Cockerel Village House is an authentic, local family house in Colomb village, located at a small bay between Palolem and Patnem beach, it is build about 50 meter of the water front, in between the rest of the family houses dotting this coastline. The house has 2 bedrooms, a living room, a large veranda, and a garden at the front side of the house, one of the bedrooms is set with a double bed and the other with a single bed. The House is also equipped with a complete kitchen setting and a western style bathroom, with hot water shower. There are ceiling fans in each room and mosquito nets hanging over the beds, the house has some light furniture, and 2 extra mattresses for your use. The area around the house is very tranquil, and the people are very welcoming and sweet. 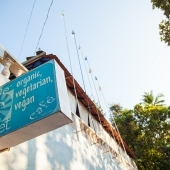 Obviously, Cockerel Village House is a very simple and humble accommodation option, perhaps somehow this fact is the secret of its charm, allowing one to experience a true Goa village life style.